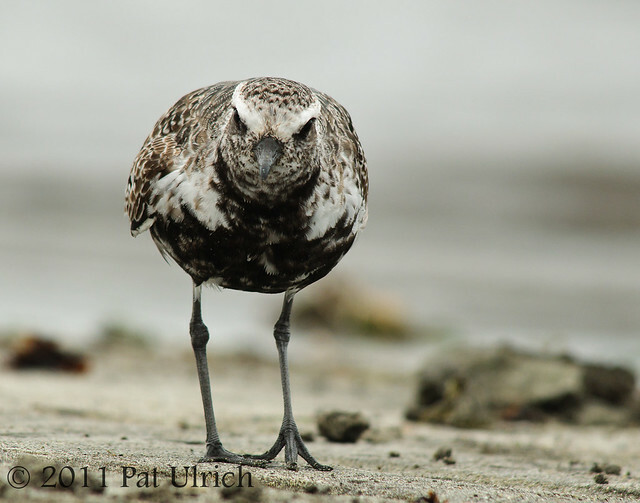 See more images of these shorebirds, including their winter plumage, in my Plovers Gallery. Submitted to World Bird Wednesday -- Follow the week to check out this weeks posts! ha ha! great shots tho! Tomorrow my wife and I are going to Point Reyes and try our luck. Thank you for the motivation. Thanks, Sinbad! I hope you guys have a great trip! Looks like it will be a gorgeous day tomorrow. Great close ups Pat. Boom & Gary of the Vermilon River, Canada. Beautiful shots - great details! Incredible Pat, it's like the bird hopped past your filter and into your lens. I'm crazy about the first shot and how that raised foot catches my eye and implies motion. Your depth of focus seems really deep for such defused light too. Just the miracle of great know how, phenomenal equipment, and a dirty jacket I suppose! She does look more accepting of you in the second shot, Pat. Very beautiful! Such intensity. Great shots Pat. I love watching the transition as they develop the full black waistcoat. A great post and beautiful images. Well done! (Oops! Too many spelling mistakes in my previous attempt!) Great photos. I especially liked the one in the gallery with the full black front. Great shots as always. I've only seen them in the fall and would love to see one in breeding plumage. I love both - the story about your loving and undestanding wife and the bird and splended quality of your pictures! It is really posing for you! Great pictures. It is always fun to get close to the birds. I'd say those great closeup shots were well worth the trouble you went to! Well done! Superb perspective, Pat. Well worth laying on the sand to get them! Beautiful captures Pat..well worth the effort. Great shots - well worth the damage to the jacket and dissapoval of your wife. I get similar problems when I ask my wife to pull the car over so I can take photographs. Its the long sigh and a look that says it all! The effort was worth the while, beautiful captures! excellent photos!! Dont you love when they DONT try to fly away from you? What neat photos and birds. I love how the bird in the first photo has his foot up ever so slightly and you can clearly see his feet. Nicely done. Great shots, love the way it is posing for you. Beautiful bird! 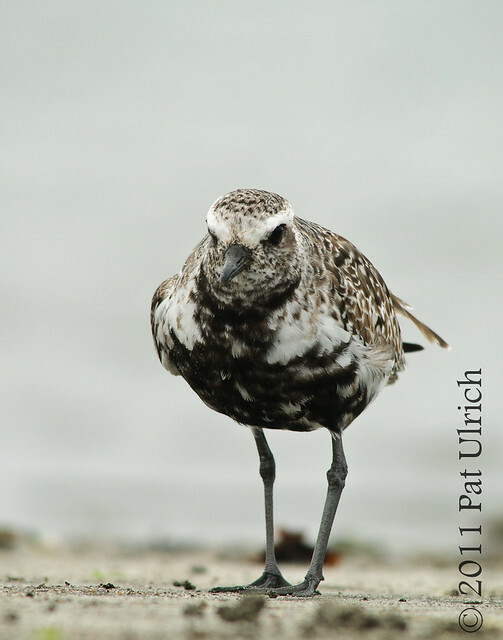 Wow, awesome closeups of the Black Bellied Plover. They are beautiful birds. Oh what a marvelous idea to lie down in the sand and wait until the birds think you belong there! I'm going to a workshop to photograph horseshoe crabs and the shore birds who eat them (when they come ashore at Slaughter Beach DE in vast numbers in May) and will 'borrow' this technique (unless the crabs are so thick there is no bare sand)! Nice shots, Pat! He takes a good look at you, wondering whether you are edible?